Battlefield 3's much-anticipated open beta starts on Thursday, Sept. 29, the publisher said this morning. 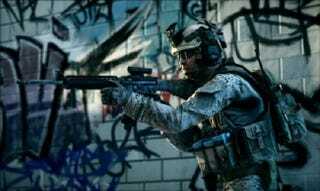 The beta will run until Oct. 10 and will give players a chance to check out the game and the social platform Battlelog, according to the post on the official website for the game. The beta is set in Paris on the Operation Metro map playing the game's Rush mode. If you pre-order the PC digitial version of Battlefield 3 on EA's Origin store before Sept. 25, or if you bought Medal of Honor: Limited Edition/Tier 1 Edition, you will get 48 hours early access to the Beta, meaning you can start playing Tuesday, Sept 27. For Xbox 360 and Playstation 3, the open beta will be visible on the consoles' digital marketplaces under Battlefield 3. For PC, you need to install Origin and download the Open Beta from within the Origin application. The first thing I notice when I maneuver Sgt. Henry Blackburn, 1st Recon Marine, through the smoking door frame of the Tehran apartment complex isn't the smoldering bodies lying on the ground nearby, it's the piece of paper drifting through the room. The last time I played Battlefield 3 on the PS3, it had some problems. But that was the game's co-op mode! The game's singleplayer code is looking a lot healthier.